Completely isotropic 1/(4 pi) phase function. 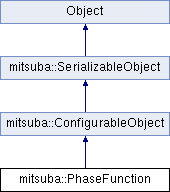 Create a new phase function instance. Returns the mean cosine (often referred to by the constant "g") of this phase function. Return information flags of this phase function, combined binary OR. Does this phase function require directionally varying scattering and extinction coefficients? Calculate the probability of sampling wo (given wi). Sample the phase function and return the importance weight (i.e. the value of the phase function divided by the probability density of the sample). When the probability density is not explicitly required, this function should be preferred, since it is potentially faster by making use of cancellations during the division. For anisotropic media: evaluate the directionally varying component of the scattering and absorption coefficients. Returns the maximum value take on on by sigmaDirMax(). This is useful when implementing Woodcock tracking.